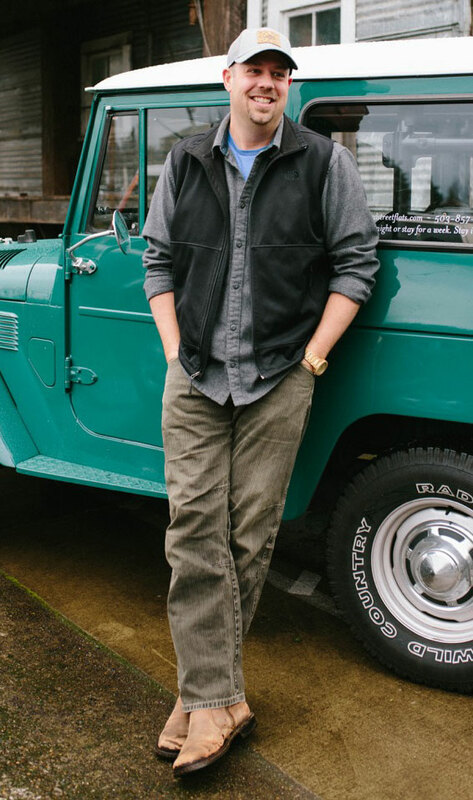 Atticus Hotel co-founder Brian Shea was raised in Oregon’s capital city of Salem. He went on to earn a graphic design degree from Oregon State University before heading to California to launch his career. All the sun and sea in the world couldn’t keep Shea from a triumphant return to the Beaver State. Shea returned to McMinnville, married a McMinnville native (Dianne) to raise a family. In 2011, Shea joined fellow Atticus Hotel co-founder Erin Stephenson to operate Third Street Flats and then earlier this year to open the Atticus Hotel. The wilderness admirer loves to golf, hunt, fish and explore the state’s many unspoiled areas. Here, Shea offers some insights on both work and play. What was the best thing about returning to Oregon after working elsewhere? There is a strong feeling of belonging and place here in McMinnville. I am surrounded by a community of friends and local people who love to be here and support your passions. Also, I didn’t realize how much I missed the changing of seasons and I am a huge fan of autumn in the Yamhill Valley. What is your favorite thing about McMinnville? This town has a large heart with an unique vibe. It’s evident everywhere you look and in everyone around you that people want to be here, to live here and to thrive here. We truly want to share our passion for McMinnville with visitors. Plus, Dianne and I have made life-long friends here and both of our families are close. The Atticus Hotel has been at least a dream of yours for quite a while. What’s it like to step inside the real thing now? Honestly, a bit unreal at first. I catch myself paused, looking at the real thing like it is a sketch on a wall. When you walk inside there is a special buzz with a mixture of locals and visitors mixing to make it feel alive. One of my favorite places to be is in the lobby to absorb the fun energy that exists in there. With a graphic design background, do you tend to see things more visually? And how does that relate to the Atticus project? I have always been a visual person. The different rooms and spaces in the hotel felt immediately comfortable and familiar because I lived inside the space mentally during the design and construction phases. I imagined the nuances and the little details long before it was a reality. And after working with so many various clients on their graphic design projects, it was immensely easier to translate our own ideas and thoughts into a design and brand concept. Has extensive work in the real estate trade armed you with any good wisdom? The wisdom I have gained from my commercial real estate management experience is: Don’t let it intimidate you. Over the last 15 years I’ve bought, sold and managed many properties. When looking at investment property be prepared to walk away if the numbers don’t work for you, but also don’t kill a deal just because its a good deal for the other party too. As an outdoors enthusiast, are there not-to-miss stops visitors should consider? Depending on your level of adventure, there are so many places for visitors to consider. One of my favorite things to do is to take a fishing trip out of Depoe Bay or a guided steelhead (salmon) trip on one of our rivers. You could go on a bike tour or saddle up and taste wine on horseback. A fun culinary adventure is to experience a forage to fork meal and a hot air balloon ride over our local countryside is cool! Are there qualities about the Willamette Valley you think get overlooked or unnoticed? I can’t say enough about the quality of the people who come together to make the Willamette Valley a special and unique place to live and visit. It’s what makes everything so great. One of the best features of the Willamette Valley is the quality of our food produced by our local farmers, the dishes created by our local chefs and the wine and beer crafted by our local winemakers and beer masters. Often times people seek complexity when I feel the true essence of the Willamette Valley is in the simplicity of our local bounty. Any other advice for visitors? Don’t be afraid to try a beer. Our state offers some of the world’s best locally-crafted beer. Also, treat yourself by looking for menu items that focus on local seasonal food which might be something you can’t get at home. There is so much to experience here in McMinnville and the Willamette Valley so we hope visitors will fall in love with the area and want to come back to explore even more of the adventures we offer.